You'd think after more than 30 years and 19 albums, magic might be one thing that prog masters Rush would be short on. But, the Canadian power trio are still conjuring it up by the bucket load night after night, according to Neil Peart. 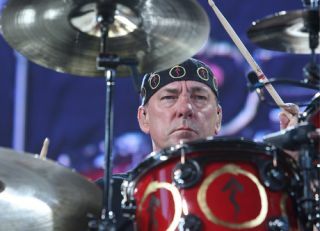 In a new post on his website, Peart suggested that things just keep on getting better and better for the band, saying that "the magic still happens". He gushed: "Even well into the second leg of the tour, after almost twenty shows, I felt that we seemed to enter a new 'zone.' The basic structure of the show, the details of arrangements, tempos, and transitions, had been refined night after night as we went along (noting that we rehearsed for two months for what was to have been a three-month tour), but once we had nailed down the foundation, each of us was reaching higher." You can read more on 'The Yoda of Drums' in the latest issue of Rhythm.